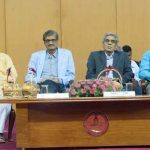 Visakhapatnam: Vice President of India, Shri M. Venkaiah Naidu said it was time for the education system to be re-oriented by moving away from the colonial mindset. He said that a nation that does not derive inspiration and energy from its history would find it very difficult to meet with the challenges of the future. 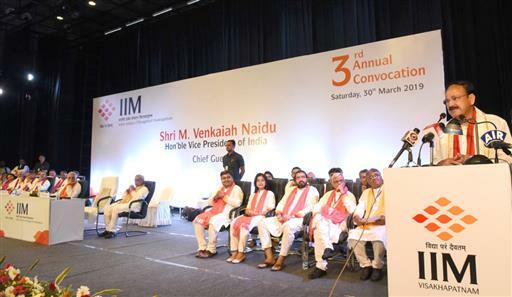 “We must teach history in an objective manner as it actually unfolded”, he said, while delivering the Third Convocation address of IIM Visakhapatnam today. Stressing that education was not just for employment, the Vice President said that education must empower an individual with knowledge and wisdom. The Vice President opined that access to quality education for all and at all levels was essential to ensure inclusive growth and prevent any form of discrimination. He advised students to update their knowledge and skills with the changing needs of the 21st century global job market. “New knowledge transforms old paradigms. You can and you should keep yourself ahead in this knowledge revolution,” he said. 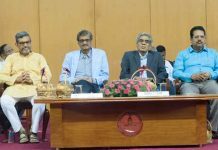 Shri Naidu said that the time has arrived for India to once again emerge as the global knowledge hub and for that to happen, he opined that the seats of learning, especially the universities, must reinvent themselves as hubs of vibrant intellectual pursuit and as centres of resolute research and innovation. Talking about the importance of agriculture in the growth of a nation, the Vice President said that revitalizing and rejuvenating agriculture was of utmost important. He said that one should not hesitate to introduce a number of structural changes in agricultural sector to make it profitable. Shri Naidu also called for united efforts from the government, scientists, agriculture research institutes and farmers to work in unison to ensure food security with home-grown nutritious food. “I have always maintained that India cannot survive on imported food security,” he said. The Vice President lauded IIM Visakhapatnam for mentoring and guiding about 25 aspiring women entrepreneurs from AP and Telangana. He said that such initiatives of women empowerment would act as a force-multiplier and transform families, economy and the society at large. The Chairperson, Board of Governors, IIM, Shri Hari S. Bhatia, the Director, IIM, Vishakhapatanam, Prof. M. Chandrashekhar, faculty and students of the institute were present at the venue. “I am always happy to be in Visakhapatnam, especially on an occasion as special as this one. It’s here in Andhra University that I studied law and had my initiation to public life. The hallowed precincts of Andhra University and the fresh-breeze of this beautiful city energize me and bring me countless wonderful memories, every time I visit. I recall with great fondness my taking part in the Foundation Stone Laying Function for the permanent campus of this Institute on 17 Jan. 2015. I do look forward to the day in 2021, when IIM-V would be operating from its sylvan campus in wholesome surroundings, scaling up its activity-profile in scope, spread and specialization. I am happy to see that this nascent Institute is already being acknowledged as being at the forefront of performance among the all the seven new- generation IIMs set up around 2015. I compliment the Board, the Director and the entire Institute for the high accomplishments and also congratulate the teachers and students. My special praise to the graduates and medal winners who have lived up to the expectations of their parents, teachers, elders and well-wishers. The real life-journey starts now. All that you have learnt in this institution will provide you the basic tools for your individual and professional growth. It depends upon you as to how you go on adding to this pool of knowledge. You must constantly update your knowledge and skills because the world of work is constantly changing. New skills sets become essential. New knowledge transforms old paradigms. You can and you should keep yourself ahead in this knowledge revolution. True education gives us humility to become lifelong learners. With constant learning, we constantly upgrade our competence. It is time that we re-orient our education system by moving away from the colonial mindset. For a long time we have been teaching History from a colonial point of view. I strongly believe that a nation that does not derive inspiration and energy from its history will find it very difficult to meet with the challenges of the future. India has a glorious history, a splendid past that we can all be proud of and rejoice about. We therefore must teach history in an objective manner as it actually unfolded. Let me impress upon you that education is not only for employment. Education should empower the individual with knowledge and wisdom. Access to quality education for all and at all levels is equally essential to ensure inclusive growth and prevent any kind of discrimination. Time has come for India to once again emerge as the global knowledge hub, he said. For that to happen, the seats of learning, especially the universities, must reinvent themselves as hubs of vibrant intellectual pursuit and as centres of resolute research and innovation. Education is not only for employment. It should empower the individual with knowledge and wisdom to sift the wheat from the chaff. Access to quality education for all and at all levels is equally essential to ensure inclusive growth and prevent any kind of discrimination. Time has come for India to once again emerge as the global knowledge hub, For that to happen, the seats of learning, especially the universities, must reinvent themselves as hubs of vibrant intellectual pursuit. As we become more competent, we access better livelihood opportunities and acquire wealth. If we can then have the wisdom to share our prosperity with others, we get tremendous satisfaction. That is true joy. What one needs is to develop competence as well as ethical conduct, unwavering commitment and confidence borne out of ceaseless quest for knowledge. I urge you to be bold and think out of the box. Some of you should choose the path of experimentation and entrepreneurship. There could be no better place than India of today for this experimentation. It’s heartening to learn from the recent NASSCOM Summit (National Association of Software & Service Companies) that India has the 3rd largest Start-up Eco-system in the world (behind USA and UK), with 7,700 companies (including 1200 in technology domains). What is amazing is that more than 40% of the new start-ups are being formed outside the metro regions i.e. in Tier 2 and Tier 3 cities, including Vishakhapatnam. Another distinguishing feature of this aspect has been the rise in the number of women entrepreneurs in these start-ups, to 14% from 10% over the previous two years. The Indian Start-up Ecosystem has led to the creation of 40,000 new direct jobs, while indirect jobs are estimated at a dozen times that number. The total employee base in the Indian ecosystem today is estimated at about 1.7 lakh. Reflecting this trend is the phenomenal growth of our MSME Sector. The Ministry’s 2017-18 Annual Report says, MSMEs are contributing to 29% of GDP. More than 20% of the total units are owned by women. We must also strive to revitalize and rejuvenate our agriculture. To improve labour productivity in agriculture, we need greater on-farm value addition/agro-processing and innovative institutional arrangements in the sector which will improve the bargaining strength of farmers in the market. We must not hesitate to introduce a number of structural changes in our agricultural sector to make it profitable. I am pleased to know in this context that IIM Visakhapatnam is mentoring and guiding about 25 aspiring women entrepreneurs, 17 from AP and 8 from Telangana, notwithstanding their socio-economic status; literacy or knowledge levels; and helping them convert their dreams into deeds. I hear that the results are extremely encouraging. Women’s empowerment is a force-multiplier. It transforms families, economy and the society at large. I look forward to IIMV emerging as a major hub for incubation; entrepreneurial-learning and development in the times to come, with special attention paid to women’s empowerment. Of course, there is a long-way to go. In India, there are about 8 Million women entrepreneurs out of a total of 59 Million, or about 14%. This needs to go up substantially. Swami Vivekananda had said: “There is no chance for the welfare of the world, unless the condition of women is improved. Institutions like IIM-V should provide a platform for knowledge-transfer, experience-sharing, original research and innovation. As Babasaheb Bhimrao Ambedkar had said, “An idea needs propagation as much as a plant needs watering. Otherwise, both will wither and die”. I am therefore glad that the Institute is nurturing talent and fostering excellence with a clear focus on social equity and gender sensitivity. Albert Einstein had said: “The significant problems we face today, cannot be solved at the same level of thinking we were at, when we created them”. The challenges of today and the emerging challenges of tomorrow need creativity, design-thinking and a solution-seeking mind set and competence. The solutions should lead to a more inclusive, sustainable world. In all our actions, there should be Value for Many, besides Value for Money. We need sustainable solutions for the common man’s everyday challenges. We need good policy support and resource-management advice from Institutes such as this, for our science, technology and innovation to fructify and improve the quality of human lives. Please focus on being among the best in your field. Shun mediocrity. Let excellence be your guiding principle. Passionate professionalism and positivity can help convert potential into possibilities and propel you to higher levels of performance. My concluding piece of advice to you, students, is the same message that Swami Vivekananda had given to the youth, based on the Upanishadic call to “Awake, arise and stop not till your goal is reached”. Keep your eyes wide awake, keep your ears to the ground and keep moving gathering knowledge and using it with wisdom to create a better planet. I am proud of IIM Visakhapatnam and its accomplishments. With its many firsts, it has all that it takes to scale greater heights of performance. I am therefore positive that this Institution of National Importance will attain standards of global excellence in management-education, management-research and allied areas of knowledge, fulfilling the Objects enshrined under the Act.